Originally published in 1984, this book broke new ground in assessing Freud as both an exemplary late-Victorian and as a pivotal figure in the creation of modern thought and culture. 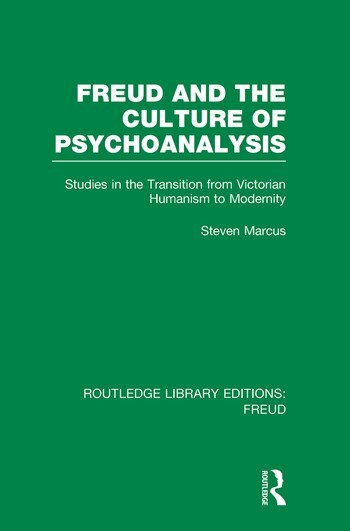 In his close reading of various of Freud’s theoretical and clinical texts, including two of the most famous case histories, Steven Marcus uncovers the steps in the development of Freud’s thought, the dynamics and contradictions and ‘the intellectual and emotional urgings, forces and conflicts that were at work… as the first original insights and discoveries that constituted the inception of psychoanalysis as a theory, discipline of inquiry, and new kind of therapy, came suddenly, often unexpectedly and without being bidden, upon Freud’. Central to Professor Marcus’ inquiry is the relationship of Freud’s work to cultural change and to the very process of disclosure, formation and construction in the transition to modernity. Freud’s writings, and the psychoanalytic discipline of which they are the foundations, are placed in the context of their contribution to modern modes of thought, and of their influence on our notions of the centres of significance of each existence as a whole. Freud and the Culture of Psychoanalysis is a major contribution to our understanding of how ideas and theories become internalized into the intellectual framework of our lives and affect the way we think about the world. By moving backward and forward from pre-Freudian to post-Freudian thinkers, Professor Marcus takes us on a journey through cultural transition that is also an exploration of how the individual interacts with his own moment in history to forge new modes of consciousness. Acknowledgements. Introduction. 1 The Origins of Psychoanalysis Revisited 2 Freud’s Three Essays on the Theory of Sexuality 3 Freud and Dora: Story, History, Case History 4 Freud and the Rat Man 5 Psychoanalytic Theory and Cultural Change 6 Some Cultural Precursors of Psychic Change 7 Freud and Biography 8 Postscript: Notes on Psychoanalysis Today. Index.